A team of researchers led by the our University has shed new light on how the regulation machinery that controls gene expression works by characterising a complex known as the NuRD complex. The study, led by John Schwabe, Professor of Structural Biology and Head of Department of Molecular and Cell Biology and published in the journal eLIFE, focuses on three protein components which make up the core of the NuRD complex: MTA1, RBBP4 and HDAC1. The function of the NuRD complex is to control the amount of protein made by the cell – a process called gene regulation. Unregulated protein expression disrupts the equilibrium within a healthy cell and can lead to abnormal cell division and tumour growth. The NuRD complex components HDAC1 and MTA1 have both been shown to be present in high levels in certain cancers. A clearer picture of how these proteins interact may help to develop strategies to reduce the activity of the complex and bring the cell back into equilibrium. 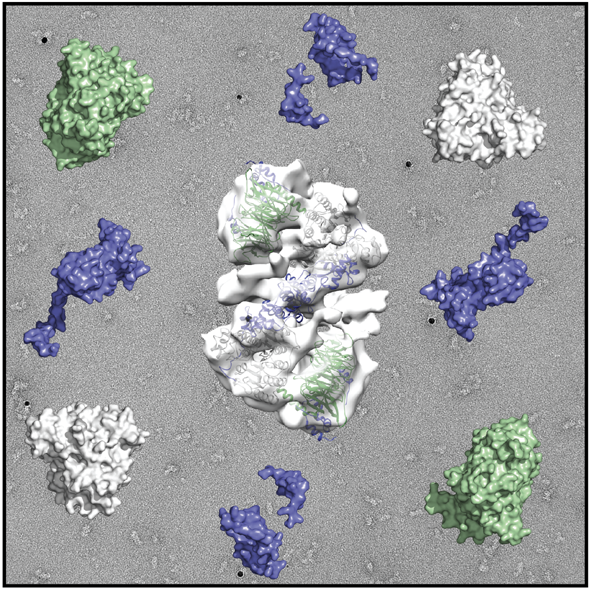 By examining the relationship between the three proteins, the team was able to show unprecedented detail about the 3D structure of the NuRD complex as well as to characterise the molecular nature of the ‘extensive interface’ between MTA1 and RBBP4. The findings paint a clearer picture about how the complex is assembled and the way in which it interacts with the proteins that package the human genome in the cell. A deeper knowledge of how these complexes are recruited to genes will help to design treatments to combat aberrant gene activity.